A New Zealand topographic map is a new map source available at BackCountry Navigator. Below is an introductory video. New Zealand topo maps sourced its information from Land Information New Zealand (LINZ), the country’s national mapping organization for the past centuries. LINZ is the source of New Zealand’s geographical information and responsible for the country’s national topographic mapping until the present. New Zealand topographic maps are used by businesses for mapping new land projects, by government departments as aid in promoting tourism and by tourists for hiking or wandering around the country. BackCountry Navigator Android GPS app is one of the applications that support an offline New Zealand topo map. It can be downloaded directly through the app using Mobile Atlas Creator or through their website at http://www.nztopomaps.com. New Zealand topographic maps mentioned BackCountry Navigator as one of the mapping applications that can be used by an Android phone to access a New Zealand topo maps in offline mode. Offline navigation means that you can select a specific location within the New Zealand topographic map before you head out to areas that may or may not have a network signal. A well-designed Android GPS app such as BackCountry Navigator will let you download the map and view your location even without network coverage. It is maximizing GPS at its best by overriding the need for a GPS signal. Mobile Atlas Creator was created for downloading sections of maps from online sources like the internet. This is because it is almost impossible to download the topo map of a whole country in any GPS smartphone. The complete set of data is too huge for the capacity of a GPS device. Mobile Atlas Creator is used in cases where only a portion of a map is needed for offline use. To preview the New Zealand topographic maps on your Android device please visit http://m.nztopomaps.com . A safe, sustainable and innovative society relies on having ready access to topographic information. With the help of LINZ, it ensures that New Zealand topographic mapping information is capable of serving the country’s changing needs. Whitewater Android maps are now available to help users enjoy whitewater with their Android device as a navigation aid. Whitewater kayaking is one of the sports that are favored today because it is not only an outdoor sport, it tests the paddler’s skill, expertise and stamina. There are professional paddlers who want challenge by braving the rapids and there are those who paddle for leisure and enjoy the nature’s trail with the whole family. Navigation in whitewater has been a great concern for paddlers. There are plenty of handbooks and guides for whitewater. However, this does not give the paddlers real time navigation. They need a device that can give them complete information about their exact location on the river. When Android mobile platform was launched, Android GPS turned smartphones into a GPS device, usable for whitewater and other activities. BackCountry Navigator, listed as one of the best Android travel apps, offers a whitewater trail map as an add-on purchase. The data comes from US Trailmaps, Inc, known for creation of GPS grade digital maps and trail systems. With the current presence of Android mobile devices, whitewater android maps have become a convenient accessory. Venturing into the world of whitewater kayaking is an inherently dangerous activity. It is just you and a small boat against what the nature has to offer. Make sure that you have received the proper training first and now completely familiar with the boat and the equipment needed to traverse whitewater safely. Most of all, ensure that your Android GPS device is ready, configured and protected to get the best of your whitewater adventure, whether it is for the challenge or enjoying a rare family time. Whitewater Android maps are available as an in-app or add-on purchase with BackCountry Navigator PRO. Snowmobile Trail Maps for Android are available as an add-on purchase with BackCountry Navigator PRO. These are created by US Trailmaps, Inc.
One of the many ways to have fun in the snow-covered backcountry of the US is through snowmobiling. Snowmobiling is an adventure that gives you a chance to enjoy hundreds of thousands of acres of stunning territories, even in areas that are too secluded to be easily accessible. If you are one of the snowmobilers who are smart enough to use an Android phone as a GPS device, you will appreciate BackCountry Navigator snowmobile maps. It will save you long hours of research to locate your planned rides because these maps include thousands of numbered intersections for reference with added detail such as a trail names. It also has search capability. BackCountry Navigator snowmobile map contains over 195,000 miles of trails complete with information for full navigation. BackCountry Navigator Android GPS app lets you download and view snowmobile maps in your Android device even in areas without network coverage. Only BackCountry Navigator can function as offline navigator, which means it can still provide GPS service even in areas without network coverage. The trails that you've previously previewed or downloaded will even show on the maps. BackCountry Navigator is the best Android GPS app for snowmobiling because it completes the objective of US Trailmaps to provide snowmobilers with real time navigation. 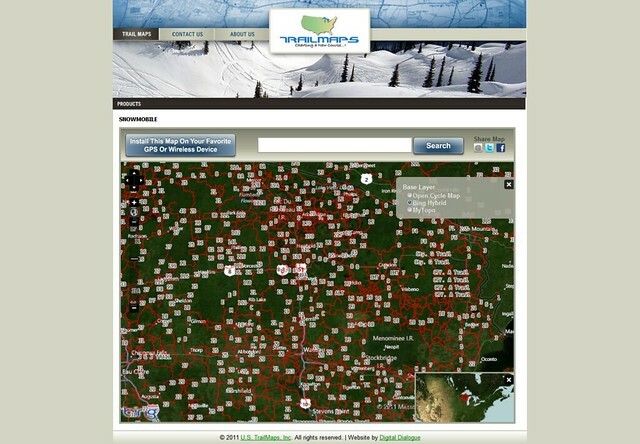 To view the coverage of the map and find out your favorite trails, preview can be found here: http://www.ustrailmaps.com/products/snowmobile.cfm or view the example here. BackCountry Navigator sells snowmobile maps for Android. Snowmobile Maps for Android can be purchased from the Android market from within BackCountry Navigator PRO. You can find it by using the menu item More-> "Purchasing Add-ons". What would the chances be of getting NZTM added as an option? I have not used this program much but just saw that I am suppose to be able to use it for Geocaching. I read the instructions. Went to Geocaching.com and had it send me all the caches in my area I loaded them on my Samsung Galaxy Tab and opened them. The caches installed in every other map program on my tab except BackCountry Navigator. It was not even one of my choices. Is there some simple thing I can do to get the GPX files into BackCOuntry? By the way, doesn’t anybody moderate these forums? What is with the wedding dress posts? ?